The best part about the holiday season? The buzz. For me, it is all about the prep. The cooking. Wrapping. Shopping. Writing letters. Drinking hot cocoa like it is your job (<-- just me??). The general anticipation of good tidings & great joy. Another fabulous part? Wearing day time sequins! This season I'm upping my holiday glam factor with new products I've discovered thanks to Glossybox. I've said it before, but I'll say it again… going out searching for new beauty products scares the bajesus out of me… too. many. options! I need the already hand picked selections to find their way to my doorstep all on their own! Currently loving (& wearing in this post): "Crimson Wonderland" lipstick from The Lip Bar (my new favorite red), Cargo cosmetics liquid eyeliner (the easiest cat eye ever, and I am cat eye incompetent! ), Korres mascara (so smooth! ), Calvin Klein "Reveal" scent, NCLA nail polish in "Satin Sheets, Velvet Ropes" (5 free… so none of the bad stuff! )… all found in my last Glossybox! The new Holiday box just arrived on my doorstep last night, & it is another fully loaded delivery! I have been getting boxes for 4 months now, & I must say, if you are still looking for a gift to get your girlfriends, a Glossybox subscription should be topping your shopping list! Get your 6 month subscription for $115 now! I received a complimentary subscription to Glossybox, but as with all brands/products that I promote, I truly love this service, and all opions & reviews are my own! If you have any questions, shoot me an email! Hot cocoa is definitely required at this time of year! I love the polka dots and bag, such a great pop of colour. Perfect tee and purse, you look great in this casual outfit! I love that red lipstick, Glossybox seems amazing! I love this outfit combination. 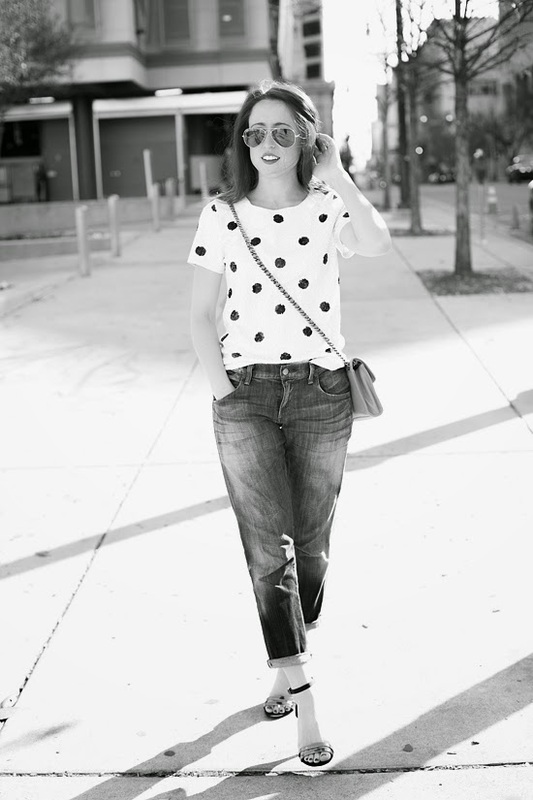 The polka dots + rolled up jeans + strappy heels = fantastic. I love the contrast of distressed boyfriend denim and the sequin top! I love that bag! The holidays are all about the buzz for me too...then they are over WAY too quickly! Have and love this top- love the casual but chic way you styled it and the pop of red! I love this sparkly polka dot top! What a cool look. 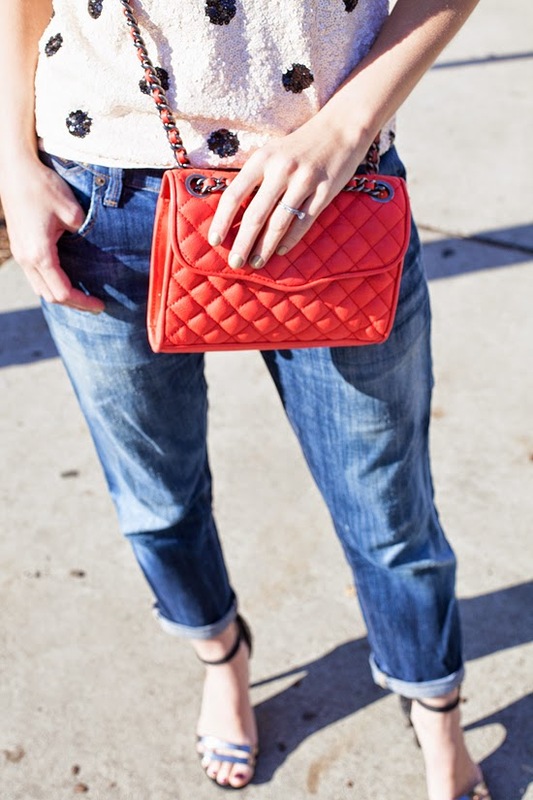 And the boyfriend jeans and bright bag are a perfect touch. R KELLY IS STILL A THING? Sorry, not the point of this post. Looking great as always (you, not R Kelly)! I remember trying on that top last year and sadly it did not look this great on me. Thank god for sunshiny days this time of year, I feel like we've been living in Forks here in the area as of late! Tell me about it!! I get super overwhelmed going into Sephora unless I actually know what I'm looking for. Way too many choices! Loving the outfit, as always! How cool and inspiring! I love your top!